Wednesday July 8 1908 Ida did some washing this morning I did churning Will was having hay taken from the barn to sell. I was kept busy with the work. In afternoon Nellie rode with us as far as home and Ida & I went on to town for things I needed and we went to the cemetery. They finished plowing the corn for the 5th time. Nellie did not come back. 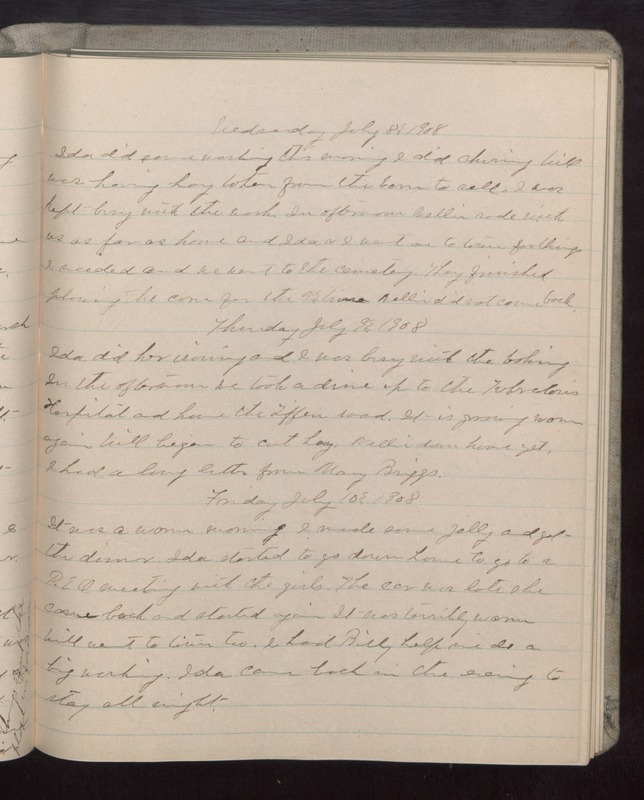 Thursday July 9 1908 Ida did her ironing and I was busy with the baking In the afternoon we took a drive up to the Tuberculosis Hospital and home the [Tiffen?] road. It is growing warm again Will began to cut hay. Nellie down home yet. I had a long letter from Mary Briggs. Friday July 10 1908 It was a warm morning I made some jelly and get the dinner. Ida started to go down home to go to a P.E O meeting with the girls. The car was late she came back and started again It was terribly warm Will went to town too. I had Billy help me do a big washing. Ida came back in the evening to stay all night.